1). 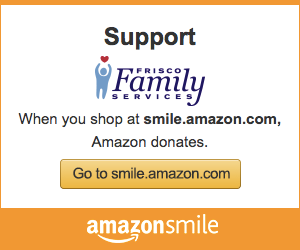 AmazonSmile is a simple and automatic way for you to support Frisco Family Services every time you shop, at no cost to you. Log in to your Amazon account through smile.amazon.com and select Frisco Family Services as your nonprofit organization to support. 2). Click here to view a list of our needed Food Pantry items to add to your Amazon shopping cart and donate to Frisco's only community Food Pantry. Delivered directly to the Food Pantry.